The original concept for this piece was formed on a trip to my hometown near Pittsburgh, in the spring of 2000. I was driving along a highway that followed a very industrialized portion of the Ohio River. My view was dominated by a mass of steel factories and their billowing smokestacks pouring unknown amounts of damaging byproducts into the surrounding environment. I was struck by the random beauty of the smoke against the amber glow of the factories at night. I too, was smoking; a habit that is especially hard to break on long drives. That’s when the connection occurred to me: I am no different than these factories. I am a living machine that consumes and creates. I have combined this point of inspiration with ongoing research I am currently conducting with interactive sculpture and its ability to create “random” byproducts through user interaction. In my interactive sculpture, “The Smoker,” these byproducts possess their own aesthetic. There are random ash piles that build up over time creating a beauty of their own. There are billowing smoke patterns, which the viewer is able to influence through exhaust fan switches on the control and filter boxes. Finally, there are random yellow and brown tar stains, which form in the filter device itself. The filter box has been designed to include removable filters. With enough time, these tar-stained filters could be displayed along with the piece, referencing the tar that coats all smokers’ lungs. Other intentions seemed to emerge during and after the completion of this work. “The Smoker” can be seen as an attempt to show the sublime beauty involved in smoking tobacco, while also acknowledging the damage and evil that is inherent to the act. This sculpture simulates the actions of the lungs during the process of smoking. These ideas are stressed by the sounds of my own breathing and coughing, which can be heard as the pump breathes in and out. The speed of the breathing matches the speed of the pump, which is controlled by the viewer’s interaction with another dial on the control box. 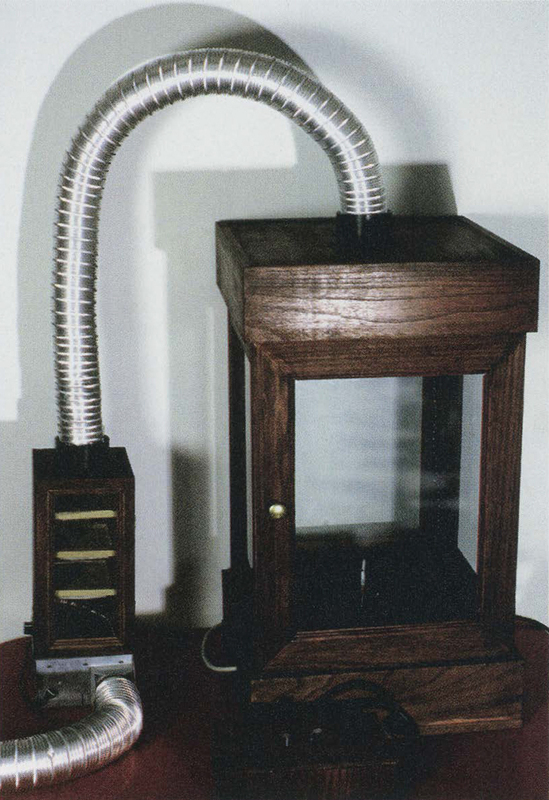 The heavy mechanical nature of this machine stresses the toxic nature of smoking. The single cigarette at the heart of this machine shows the isolation that is placed upon smokers in today’s society but simultaneously points to smokestack industries as polluters that effect the collective lungs of all. One final goal of this piece was through a closer examination of the act itself for me to quit smoking. Unfortunately, this has not worked out so well. I find myself smoking with the machine as though it was a friend on a smoke break. It has surprised me – that this machine has begun to take on a personality of its own through its ability to mimic a simple human act. In the end, I realize that though there is an intrinsic beauty created by a cigarette’s byproducts, the good still does not outweigh the evil.